Marquise and Round Diamond Vintage Engagement Ring | Shane Co.
Six marquise diamonds (approx. .47 carat TW) and ten round diamonds (approx. 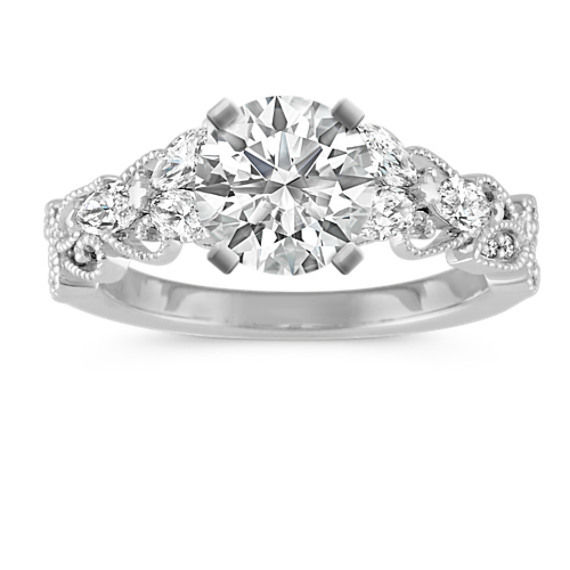 .03 carat TW), serve to highlight the center diamond of your choice in this beautiful engagement ring design. Milgrain detailing gives the 5mm ring at the center a vintage feel. The sides of the ring are approximately 4mm wide and the total gem weight is approximately .50 carat. In love with my engagement ring!!! My fiance and I went to Shane's to pick out my engagement ring and had the best experience. We worked with Tyler from the Louisville, KY location and he is simply amazing. The most valuable question he asked was "What is your price point" and he was able to show us diamonds within our price point which helped us to keep focused! I would send anyone looking for any type of jewelry to Shane's because their customer service speaks volumes and they respect people and do not push them toward products that are more expensive just because. They pay attention to details and work towards overall customer satisfaction.